When Elastic filed its S-1 in September, we wrote a piece calling “2018: The Biggest Year for Open Source Software Ever!” Over the past few weeks there’s been further evidence our claim was correct. We continue to see strong acquisitions, IPOs, and private financings in the space. The most significant exit for an open source business was IBM’s $35B acquisition of Red Hat. 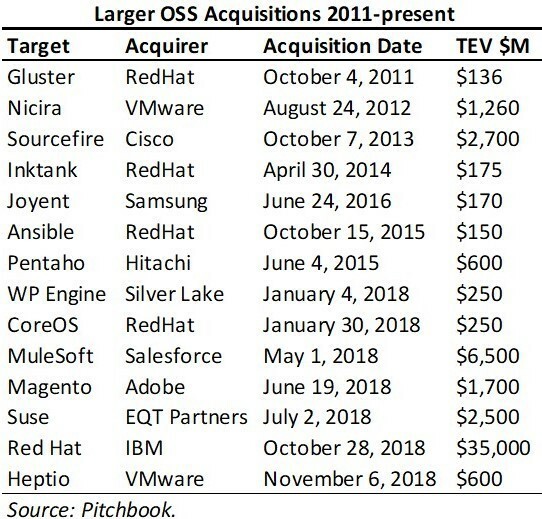 As my colleague Tomasz Tunguz claimed, it was “a triumph of open source.” Red Hat’s acquisition was the largest software acquisition in history, and the third largest technology acquisition after Dell/EMC at $67B and JDS/SDL for $41B. Next, in early November VMware acquired Heptio, a startup that helps companies deploy and manage upstream Kubernetes. Founded by ex-Googlers Craig McLuckie and Joe Beda, Heptio was mostly a services business with some open source projects like Ark, Sonobuoy, Contour, and Gimbal. Heptio competes against Red Hat so it is clear VMware is trying strengthening its role in the cloud-native ecosystem. Heptio completed its Series B in September 2017 and achieved a $117M post-money valuation, according to Pitchbook. We’ve heard VMware paid around $550M-$600M for the business, suggesting a 5X exit from its last round. There was also the $5.2B merger of Cloudera and Hortonworks. With two of the largest Hadoop players combining forces it demonstrates consolidation of the NoSQL database market. It also underscores the market’s preference for open-core and hosted open source business models. This year we’ve seen at least $46.8B spent on acquiring open source companies. 2018 represents the highest number of seven-figure acquisitions including Mulesoft, Magento, Suse, and Red Hat. The chart below demonstrates the acceleration of large deals in the space. This year two huge OSS businesses IPOed, Pivotal and Elastic. Pivotal, which offers cloud infrastructures solutions competitive with Kubernetes, is currently trading at a $3.9B Total Enterprise Value (TEV). Elastic is valued at $5.9B TEV, about one-third of Splunk’s $15.1B TEV, suggesting further upside potential. This fall private businesses also achieved healthy up rounds. We saw three businesses grow into unicorn valuations: GitLab ($1.1B), Hashicorp ($1.9B), and Jfrog ($1.0B). Of the three, Hashicorp achieved a +$1B valuation the fastest in only six years. 2018 has been the most significant year for OSS businesses ever. 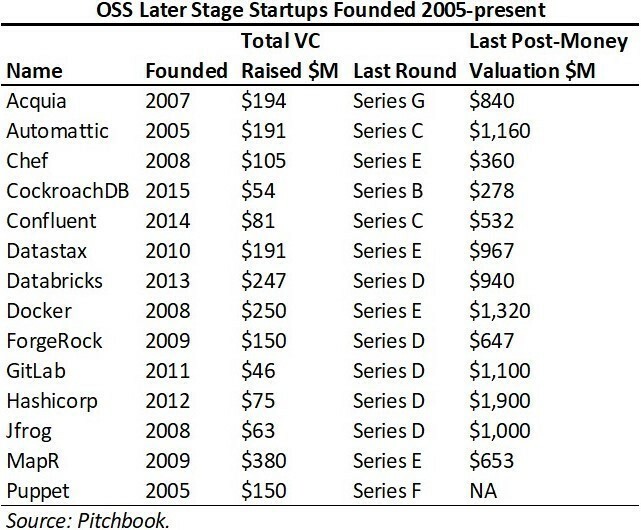 From acquisitions to IPOes to unicorn valuations, the market appetite for OSS companies is healthy. We continue to be excited about opportunities in the space and are looking forward to what 2019 has in store.